I wonder, could this be a new invention? I’ve never seen a card that combines a tent topper and an easel before but that doesn’t mean it hasn’t been done. I wanted a design that would balance out the huge rose I used and I think this works. It took me longer to decide what to put inside to support the easel portion than the rest of the card!! 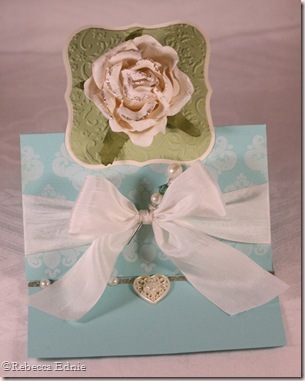 The inspiration for this card came from a gorgeous picture on Melissa Phillips blog, LilyBean Paperie. I love her blog so much, she writes so beautifully about her life and the loves of her life, her daughter, hubby and new house and of course, her fabulous shabby chic creations. Click on the photo to visit her post. 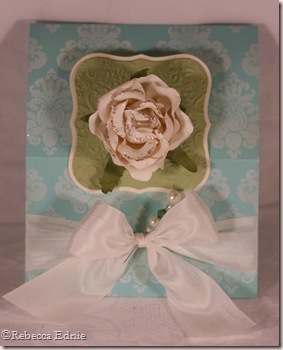 This card is large, 5” wide and 6” tall when folded flat. The rose itself is almost 1.5” tall and 2” in diameter. I stamped the damask background myself, it looks like vintage textured wallpaper or curtains because the CS has a linen texture. I used 1/8” red line tape to adhere the half-back pearls and the heart charm thingie to the inside of the card, then I coated the remaining red line tape with gold glitter. I added a bit of glitter to the rose too. I debated on putting brads, buttons, punched cardstock, lace, trim, rhinestones, pearls or mini long-stemmed rose embellishments on the inside to support the easel. Whew! Nothing was elegant enough to go with the outside of the card until I thought of this. I did have a bit of an ivory vs. white war going on. The label 1 mat and the rose are cream. The damask stamping was done with white ink that I tried to vanill-ize with Antique Linen Distress ink but of course, pigment ink resists dye ink. The only reason I tried it is that the white ink I used is technically hybrid ink. Then I had to choose between white (a winter white) and ivory (yellowish) silk ribbon. Obviously from the picture, the white won. It does look much more cohesive IRL. The colour in the pictures is out some, well quite a bit really. 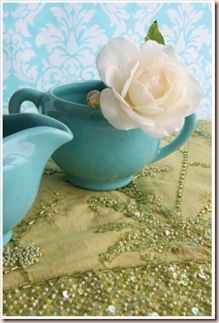 The turquoise is brighter and the green is celery by SU! I tried so many different camera settings to get better colour and I tried some simple post-processing settings too but to no avail. I can’t figure out why some colours are so easy to capture and others are so difficult. The corsage pin isn’t very easy to see, I used a flower-headed quilting pin whose head I broke off. Then I glued a large pearl bead where the flower head had been. 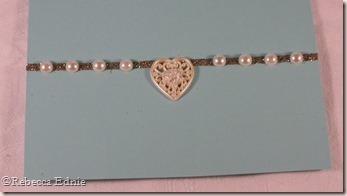 The other beads are Swarovski crystals plus one other pearl bead. The ivory mat layer under the celery Label 1 is cut by embossing the shape into the paper, then cutting around the largest indentation. This creates a perfect mat for a piece cut by die cutting normally. I hope you will take the time to be inspired by this gorgeous photo. Love! Love! Love!Thanks for sharing!